I can hardly be bothered with our lightweight and trivial media anymore. You won't get detailed or grown up analysis out of them. There is no profit is producing a worthwhile newspaper and so they publish derivative, low grade gossip and the received wisdom of the SW1 herd. It is rare that any in our media contribute anything worthwhile to the debate and in fact, they go to extended lengths to keep the debate neatly confined within the parameters they can cope with. Our media is lacking any innate curiosity and has no vitality in seeking to expand its own horizons. It then falls to the lesser known publications to set the standard. In this one instance it's the Morning Star with a very worthwhile piece examining the value of the EU Economic and Social Committee. The mainstream left like to believe the EU is some benign giver of rights and freedoms, taking everything at face value. Never once to they stop to examine the mechanisms or the politics of what they advocate. Here the Morning Star observes that "ESC members are nominated by national governments and appointed by the European Council for a five-year renewable term. Britain has 25 members and of these eight are from trade unions — including one from the TUC. A further two trade union members take part in the Consultative Commission on Industrial Change, formed in 2002. Trade union members and leaders should carefully note those who are responsible for dealing with the ESC delegation from Britain. This power rests with the Foreign and Commonwealth Office, Cabinet Office and the Department for Business, Innovation and Skills. The ESC has no power to block EU legislation. In other words, it has what is called “influence” only — which can be ignored or shelved. Compare this committee of 353 with the Corporate Europe Observatory’s estimate of 30,000 corporate lobbyists at the EU. Only a few of these are registered and the Commission — the EU’s law-making body — is opposed to registration and hence transparency. Daily these lobbyists persuade the Commission to favour their clients’ interests. It further remarks that "The ESC is set up to appear as though trade unions have some say on EU legislation but, like the European Parliament, the ESC has no powers — only influence. The effect is to completely undermine the real role of trade unions to better their members’ interests. That includes pay and conditions, which do not coincide with the interests of employers who are out to increase profits and reduce trade union rights. "Many EU policies work against trade union principles. Action is required to prevent any further attacks on hard-won rights, including those proposed by David Cameron’s government. This action must replace cosy chats in Brussels with the employers, EU officials and lobbyists. In other words, the “social Europe” does not exist and remains a myth." Now this is solid stuff as far as it goes. You would not expect anything of this standard from the Guardian which pretends to be on the side of the workers and the unions. In practice, the Guardian's salivating enthusiasm for the EU makes it complicit in undermining the values it pretends to stand for. Of course, this blog has identified many areas where the EU has replaced any genuine grassroots consultation and its dilution in this way weakens not only Britain's voice but the role of consultation in the law-making process. Like everyone else though, the Morning Star makes no mention of the global dynamic. Even by Junckers own admission, the EU is merely a recipient of labour law which is devised at the global level. It is the EU Economic and Social Committee which works with the International Labour Organisation to produce labour laws. It is already planning to replace member states at the ILO. As much as the influence of unions is muted in the EU, on the global level, we have little acting as a counterweight to the direct corporate lobbying that goes on there. The ILO conventions and resolutions are hammered out through a process of negotiation and lobbying, where corporates with highly paid specialist lawyers can and do muzzle the ILO when it comes to agreeing violations of fundamental rights, where otherwise the investigations would feed back into further resolutions and agreements. In this process, as a member state of the EU we have only limited influence within the EU - the direct involvement of unions is licensed by the state, and at the global level we have virtually no voice, no right of reservation and no veto in a process that belongs almost entirely to corporates, lobbyists and non-state actors. As much as there is no democracy in this process, our media is uniformly unaware it even exists - even the Morning Star makes no mention of it. Thus any left winger who wants to tell you that the EU protects the rights of workers is one who clearly knows nothing about it. The EU has made us passive recipients of rights that are not worth the paper they are written on - and in so doing the EU has destroyed any real resistance to attacks on workers rights. 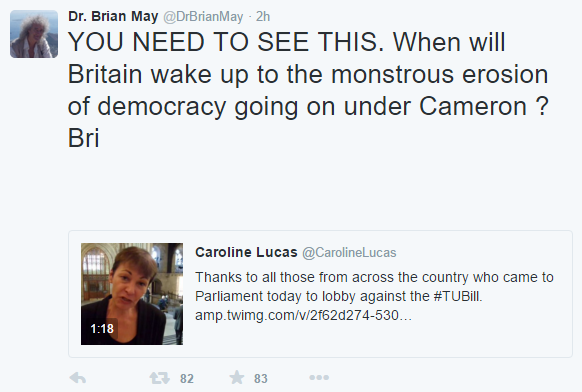 Meanwhile, today we see celebs like pop singer Brian May and Caroline Lucas indulging in the pathetic charade of Westminster politics, wibbling over the somewhat anemic and pointless trade union bill brought forth by the Tories. The bill itself doesn't actually make all that much difference since it largely deals with wholly unlikely hypothetical situations and deals mostly with the procedure. It is within the scope of what is allowed by the ILO. British politics has become a pastiche. Personally I would like to see the Tories come out with a real union reform bill that breaks up the monopoly unions like Unison and revitalises smaller unions and trade guilds. I didn't get what I was hoping for. Instead we got a dead duck of a bill which isn't worth the hyperventilation. It's hardly an "erosion of democracy". It injects a small (but pointless) element of democracy at the bottom end of a global law making chain in which there is no transparency whatsoever. This is something that happens with the direct consent and support of Caroline Lucas - assuming she's aware it exists. The only way you could be a europhile is to be entirely ignorant of it. We're supposed to be polite about this? What is David Campbell Bannerman smoking? A word about "showing unity"
The EU elites have never trusted us. What does continued EU membership look like?